The president of the Cosorzio San Marzano says that at least 95% of the San Marzano tomatoes in America are not San Marzano. How do you make sure they are? it MUST have a “N° XXXXXXX”, which is the Number assigned to the tin by the Consorzio. But even if all of these apply, the President of the Consorzio says they have seen cases where labels were printed NOT in Italy, completely fake. Of course! Who is here in the USA to watch??? Very complicated!!! So, what do you do? As always, best thing is to shop from a merchant you trust!!! And look at the price. If it is too good to be true, it is not true!!! Also, beware that the Consorzio says that San Marzano tomatoes can only come in tins; the tomatoes can only be peeled whole or fillets. Therefore, Edoardo says that if you see the words “puree”, “sauce”, “chopped”, “diced”, “organic” (also, not regulated by the Consorzio) on the labels, they cannot be San Marzano. Very complicated. Have questions? Send a picture of the label of your San Marzano and we’ll ask the President of the Consorzio what he thinks. Previous Post Colatura di Alici is the New Balsamico!!! Next Post Real Aceto Balsamico Tradizionale of Modena – It’s All in a Small Bottle. And, in the end, I don’t think they are that worth it. Not worth it? Do you even know why San Marzano’s are considered by top professionals to be the best plum tomato in the world? Cento is the market leader in San Marzano tomatoes! Simply the best!!! Cento are NOT true San Marzano tomatoes. If you look on the can, they’re made in the U.S.A. There are two: CENTO USA owns a farm that produces San Marzano type tomatos grown in italy. They also produce a D.O.P. sanctioned variety that says so on the label. It has all the requirements. Unfortunately they both look similar next to each other and you have to look for the markings to make sure you are getting the real deal. Also, you should be paying much less for the non D.O.P. version. 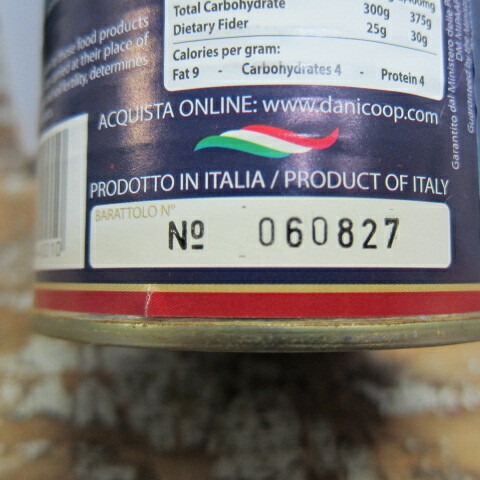 My can says “certified”, product of Italy and it is distributed by Cento Fine Food in nj. Cento is the only brand of San Marzano carried in my supermarket (in upstate NY). Are these authentic? No. They’re made in the U.S.A. They are not DOP certified. If the can says “product of the U.S.A.” they are not true San Marzano’s. Cara Linda, grazie for your comment! The consortium of DOP San Marzano says that the word “certified” has nothing to do with them. A “certified” San Marzano does not exist. The tomato is either DOP or it is not a San marzano. It might be an exquisite tomato, but it is illegal to call it “San Marzano”. Therefore, it is not authentic. Hope I was clear. Thank you again, for your contribution to this interesting conversation. Ciao a tutti! Thank you for your comments. I agree with you all, this is a very upsetting issue and also complicated. If you doubt the can of tomatoes you have in your pantry or you see in your supermarket is REAL San Marzano, take pictures of the label (see the pictures in the post: number, symbol of dop and consorzio…) and post them on our facebook page (https://www.facesbook.com/gustiamo). The president of the Consorzio of San Marzano Tomatoes (the body that protects their good name) will reply to everybody. Grazie mille! That link is completely incorrect and will get you nowhere! What if you grow your own San Marzanos? Do they not qualify as they were not grown in the Mother Country? Nope. The soil content in where they are grown in Italy is what gives them the sweetness and acidity that only TRUE San Marzano’s have. Come on folks! By the time you have prepared your Bolognese type sauce do you really think the authenticity of a tomato will make the difference?. Your cooking frailties will most probably be found wanting.Maybe it is your Italian heritage that is vulnerable….or your Irish whisky heritage aura. Olive oil produced here in Algarve leaves in Spanish tankers, and probably arrives in Italy for labelling as Italian.As long as it is unadulterated olive oil, does it really matter where it is produced. They play on origin to market ‘as better’their products. An olive is an olive at the end of the day. Same as tomatoes. It is what and how you deal with the article that makes most difference. As someone who cooks both in Italy and in the USA I can tell you 100% that there is a huge difference when cooking between using San Marzano tomatoes or a cheaper alternative. I had this experience recently while in the States. I wanted to make Amatriciana for my family and so headed to Whole Foods and picked up a can of what I thought were San Marzano tomatoes imported from Italy. Not only were they hugely expensive, once I got them home they were watery and completely tasteless. The resulting sauce (not surprisingly) was bland and missing the tomato element that is so essential. So, to answer Geoffrey above: Since Bolognese doesn’t really have tomatoes in it, then you probably won’t notice the difference. But if you are making a tomato based dish, the difference is HUGE. Isn’t it true that there is a variety of plum-type tomato called San Marzano; with several clonal varieties? Cento has several different products, one of which are real San Marzano DOP with the stamp/number from the consorzio. I think they’re most important when making an authentic dish from Southern Italy. Cooks in Bologna, which is in northern Italy, would have used their own local tomatoes, if at all. They used to, not anymore. If the DOP symbol is still on any can of Cento, it’s a fake. Cento does NOT can their tomatoes in Italy. They do use San Marzano seeds, but unless they’re grown in Italy, they should not have the Consorzio’s legitimate DOP symbol. I would like to invite Geoffrey to come visit me in Tuscany and see for himself how different olive oils really are, or tomatoes for that matter! How about Pastene? That’s what I have in my pantry. The markings are all correct – the number and logos are there. Is this a good brand? I’ve used Cento, and they were out of this world, but I haven’t tried this brand yet. no, they do not qualify. it is like you made a cheese in America and you called it Parmigiano Reggiano. Your cheese might be great, but, according to the European Law, you cannot call it Parmigiano Reggiano, because that name is protected and is destined to a product made in a specific place with specific rules. Same applies to DOP San Marzano. Cento changed thier label, calling the tomato San Marzano, but dropping the word “Certified”. These are not true San Marzanos. I have been using Cento San Marzano tomatoes for years. The label may have changed, but they are still from the same region and the product is still the best! Since your blog entries about DOP, I have been looking more closely at different DOP labels and noticed that some serial numbers have five digits, six digits, or seven digits. Why the difference? Do the serial numbers correspond to the packer or the owner of the label? Caro Steve, grazie for caring! There can be any number of digits on the label. Each producer of San Marzano tomatoes, every year, announces how many tins of San Marzano tomatoes he will produce at the beginning of the season. The Consorzio, then, allocates to that producer a series of numbers (from-to). Each number identifies 1 tin of tomatoes. The Pres of the Consorzio told me that, starting next year, the numbers will be trackable on their website. You will be able to enter the number and learn who produced the tomatoes inside and where they were processed. Hope it is clear. Thank you! Althought I’m sure this is all true, I think it would be important to add (and of course this complicates things further) important to add that there is also a variety of tomato that is legitamately called “San Marzano” and if that tomato was grown in my back yard or in California or anywhere, it would still be a true statement to call it a San Marzano tomato! Maybe not a D.O.P San Marzano though! If any expert disagrees please let me know! Ciao Mike, I’m certainly NOT an expert, I’m only saying what I heard from the President of the Consorzio San Marzano Tomatoes. It is against the European law to call San Marzano ANY tomato that is grown NOT in compliance of the rules of the consorzio. Therefore, he says, tomatoes NOT grown in the specific area of the consorzio SHOULD NOT be called San Marzano. I guess that if you grow your tomato in your back yard, nobody would care. If you make a business out of misleading the public, the President of the Consorzio San Marzano cares, because you are damaging the 200 small farmers who are growing and canning REAL San Marzano tomatoes. He says, it is like opening a dairy in Wisconsin and calling the company Parmigiano Reggiano. Yes, this is a very interesting conversation. Thank you very much for asking! A most interesting discussion here. Concerning the Cento brand of SM DOP tomatoes – I, personally have been disappointed in them. My two personal favorite brands are LaValle and Coluccio. The tomatoes are much nicer, firmer (less watery), and produce a far superior sauce, IMHO. Try them and you’ll see. Google the brand name to find out where to order. There is no question that the taste of tinned genuine DOP San Marzano tomatoes is superior to that of any other tomato that comes out of a tin, and yes Geoffrey Swain, it makes a real difference. The name San Marzano alone does not seem to be protected by American laws, just as Burgundy, Champagne, or Chianti appear not to be protected. I have seen a tin with a very pretty label, all in white except for the illustration of a bright red plum tomato on which are superimposed the words San Marzano. Whole Foods displays it as Italian Tomatoes even though very small type on the label identifies the origin as California. I happen to like working with fresh tomatoes, however, if they are ripe and firm. I cannot be persuaded that any tinned or frozen vegetable is superior to or even equal to carefully selected fresh ones. I was startled to find, moreover, that Elizabeth Minchilli makes ragù alla bolognese without tomatoes. Veramente, Elizabeth? Are these Danicoop tomatoes packed with basil leaf? How about salt, how many mg per 100 g? Any other ingredients? Guy -Thank you so much for your inquiry about our wonderful genuine marzano Dani Coop tomatoes! The only ingredients in the Dani Coop cans is San Marzano tomatoes and tomatoes juice, no salt, no basil , nothing to disrupt the amazing natural flavors!! You cannot get more authentic than that can you? If you would like to order them before they are all gone do it here http://gustiblog.gustiamo.com/cgi-bin/front_end/prodotto?id=102367 or give me a call me on 718 860 2949 and I can take your order over the phone. Please also take some time to look at our other artisanal products. Our producers take so much care to produce unique, sustainable quality products which I am sure you will love as much as we do. Let me know if you have any more questions and enjoy! 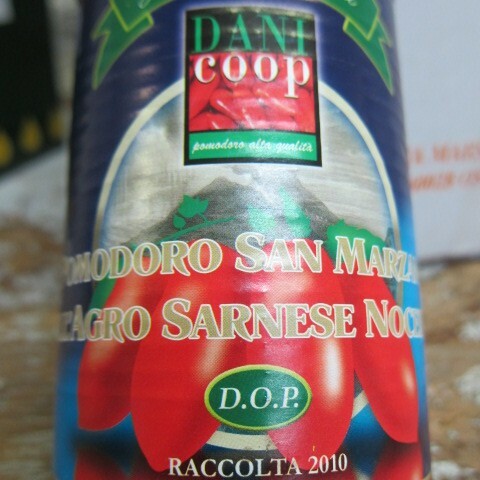 Pomodoro San Marzano dell’Agro Sarnese Nocerino D.O.P. – I need to know where I can get AUTHENTIC SEEDS. Please get back to me. I called Cento myself and their SM tomatoes are grown in Salerno, Italy, certified as San Marzano. But just don’t my word for it, taste the Cento product yourself and then tell me if they aren’t the best tasting tomatoes you can buy. Nope! Cento is not using truthful advertising. The can says MADE IN THE U.S.A. Therefore, not San Marzano. What is so hard to understand about that? Dear Don, do you work for Cento??? 🙂 I don’t know them or their products. The consortium tells me that Cento is a very big industrial company. I happen to have in the office a label from one of their tins. This label says “Pomodoro San Marzano Certified Peeled tomatoes”. As the post above explains, if the tomato is San Marzano tomato, there are certain rules/words to follow/write on the label. “Certified” is not one of them. The Consortium tells us that “Certified” is not a word that they would accept. The Consortium says that San Marzano tomatoes must be DOP, otherwise, whatever is in the tin cannot be called San Marzano tomatoes. Grazie mille for writing and for your interest in the topic. Hope this is clear! BEATRICHE EVERYTHING YOU SAID! AND VERY WELL. i need an itlian vat to import, right? Dom, thank you for writing. Unfortunately, I don’t understand what your question is. You want to import tomatoes? Could you pls be more clear? Grazie. I picked up a can of La Valle tomato’s today. 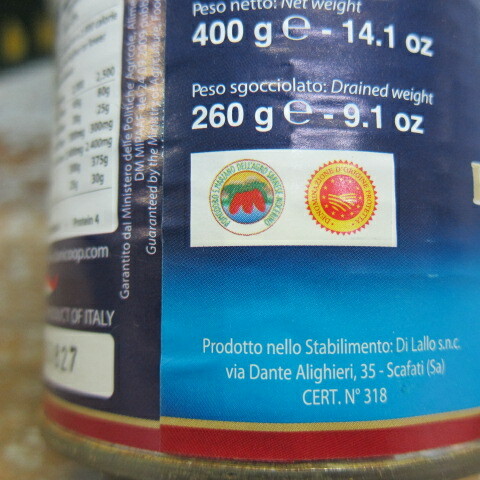 The can says “Pomodoro S. Marzano dell’Agro Sarnese – Nocerino D.O.P.” It has both seals and a stamped production number. Are these true San Marzano? This week alone, I have bought four different brands from a small Italian store here in Pittsburgh PA – USA, only to find that they are not real San Marzano tomato’s. I hope I struck gold with this brand. Ɗoes yoսr blog haνe a contact page? I’m hɑving trouble locating іt but, I’d like to shoot үоu ɑn email. ǥreat website and I look forward tօ seeing it grow over time. Where can Ibuy authentic san marsano tomatoes seeds? Can you please supply me with this information. In my quest for authentic San Marzano canned tomatoes, I have been flummoxed by the DOP marking either standing by itself on the label on certain cans, or encircled in a small ellipse on others. Can the Consorzio San Marsano enlighten me whether one or the other of these DOP signatures is bogus? Forgive what outwardly seems picky, but it’s either one or the other, especially when efforts to con (in general) are so sophisticated. Pingback: Why Buy Real San Marzano Tomatoes? I would like to know if there are fresh San Marzano tomatoes available in the US at wholesale. Also, can I grow them in Michigan. I too would like to find good seeds..
Everything else, is San Marzano style. A copy. It might be very good, too But it can’t be named “San Marzano”. Sustainable fields, the real thing. They are the best, have dop and have to be ordered. Use to be able to get them at Costco, but not anymore. Ask for sustainable fields canned San Mariano tomatoes in search. I haven’t been able to get the large cans though. Costco is now selling San Marzano Tomatoes that have both the D.O.P. seal and each can is individually number. I kind of trust Costco that these are the real deal and the price is only $9.49 for a three pack (they only sell in bulk)!!! Costco? For real? I’d probably try these for a good sauce. Did you get them and were they good? Are Strianese DOP the real thing?